Bending the sides might at first glance appear tricky; but there is no reason why with a bit of practice and careful work the first attempt should not be successful. However, always practice on a piece of scrap wood before you start on "the real thing". Wood can be bent to a certain extent when exposed to steam, and it will later retain any shape it has been forced into. Even several-centimeter -thick wood can be bent provided it is exposed to steam for a sufficiently long time. An example of this plastic quality of wood is the well-known coffeehouse chair of the Viennese company Thonet. The sides of a guitar are only 2mm (0.08") thick and will therefore bend much more easily than thicker wood. The simplest bending device that could be used would be a tube heated by a gas flame. A tube with an oval- or drop-shaped cross-section offers a variety of radii for bending, but a round one that corresponds in diameter to the tightest curve of the sides will do as well. Apart from that it is also possible to use a tube with a greater diameter (7cm to 8cm / 2-3/4" to 3") for greater and a thinner tube for smaller radii. An electrically-heated bending iron, however, is a more comfortable tool. Before bending the sides the wood has to be put in hot water for a few minutes. A bathtub or the saucer of a window planter will do nicely for this purpose. Do not put more than one piece of wood in at a time and put some weight on it to make sure it remains under water. How long the piece has to remain there depends on the type of wood used and on one's own experience: five minutes are quite normal, more than twenty minutes should not be required. Fasten the tube horizontally in a vise and heat it by positioning a blowtorch so that its flame burns into the pipe. The tube is at the right temperature for bending when a drop of water &"dances" on it. If it evaporates immediately, the tube is too hot, and if nothing is heard, the tube is too cold. The gas flame will have to be regulated or even switched off temporarily as the tube must not get too hot to not burn the wood too much. Deep burns on the outside of the wood are almost impossible to remove - so be careful when placing the outside on the bending tube. 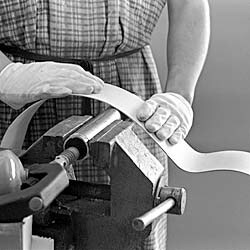 Start bending at one end, slowly pushing the wet piece of wood over the tube while pressing lightly all the time. The heat will lead to the formation of vapour. At some point the wood will start to bend and you can shape it - do so carefully and "with feeling&#quot;. Putting on cotton gloves makes the heat more bearable for the hands. By varying the pressure and the speed at which the thin wood is pushed over the tube the radius of the curve can be varied. When the desired curve has been reached continue bending for a little while; after bending is finished the wood will spring back slightly. Be careful throughout the bending process as the thin wood can easily break. Take the bent piece from the tube and hold it for a short while until it has cooled and the curve is stable. Now is the time to find out whether the wood has really been bent: on the hot tube a curve is easily produced simply by pressure; if the wood loses its curve after it has been released, it has not been bent enough yet. The wood bends properly when its fibers are saturated with water vapour - the moment when this is the case can be felt, but patience is required. To get the right curve constantly check your progress against a drawn outline and correct the curve if necessary. The latter can be done by hand by bending the piece the other way or by placing it with its outside on the tube and by rocking it until you get the right curve. When you have finished bending the first side of the body leave the second piece to soak in water and then proceed as with the first piece; try to bend it as symmetrical to the first side as possible. If the body is asymmetric in shape bending the second side will be easier as you as you don't have to make both sides perfectly identical. After both sides have been bent put the two pieces away and leave them to dry overnight or if you use a form clamp them into it. The morning after you will inevitably find that the curves will have changed slightly. The original shape can, however, easily be restored by bending the two sides over the tube for a short time. This final bending should take place before the lining is glued on as the curve of the sides will keep changing with changes in air humidity. Instead of using a heated tube you can also use more comfortable, electrically-heated and adjustable bending irons. These are available from suppliers of guitarbuilding tools.